New Members, please use the form below. Would you consider making a regular weekly or monthly donation to 1Law4All? If you answered Yes to the above question - would you like us to mail to you an Automatic Payment Form? The $10.00 Membership fee is an annual fee and gives you membership for 12 months. Note: The Membership form you are downloading is a pdf file. You will need a pdf reader to view it. If you don’t have one you can the free download Foxit pdf Reader from here. If you prefer to print the Membership Application Form directly from your web browser, please click on one of the links below, depending on which browser you are using. Once the page has opened, hold down the [Ctrl] key and press the P key. After a moment, the option to choose a printer, etc., should appear. The forms use A4 sized paper. If you’re using Chrome, click here. If you’re using Internet Explorer, click here. Opera, Sea Monkey and Safari users, please take your pick. If a person is not eligible to register as a voter in New Zealand, either because of being under the age of 18, or for residency reasons, you may still become an Honorary Member. 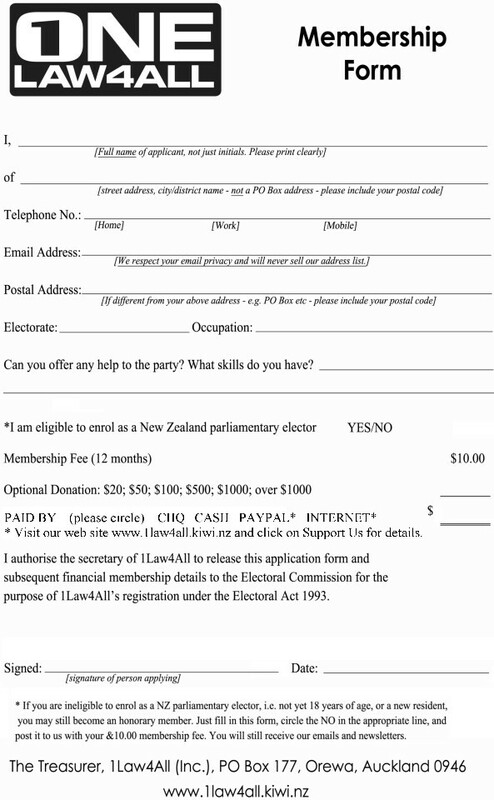 Honorary Members still fill out the application form above, pay the membership fee, and have all the benefits associated with being a 1Law4All member even though they are unable to vote in any New Zealand Election.